Norwalk, CT – June 10, 2009 — The Specialized Information Publishers Foundation (SIPF) awarded First Place to The Health Care M&A Information Service as “Best Database” among hundreds of entries. The Health Care M&A Information Service provides market intelligence on health care mergers and acquisitions through an online database, DealSearch Online and print and electronic newsletters and reports. In addition, The Health Care M&A Information Service won a top award in the “Best Reference” category. The 2009 awards were presented at the 33rd Annual International Newsletter & Specialized Information Publishers Conference held in June in Washington, DC. “This excellent product delves inside the health care mergers and acquisition field to identify and put into context the ‘who, what, when and how much’ of mergers and acquisitions in the highly diffuse health care industry,” explained Helen Hoart, the SIPF President. “To receive the top award in such a highly competitive area of publishing is thrilling. It is a testament to the hard work of the editors and the technology team who have worked together to deliver a top quality product” says Eleanor B. Meredith, publisher. Through its various publications and information services, Irving Levin Associates provides investors and senior level executives in health care with timely and reliable market intelligence, financial news, and business strategies. 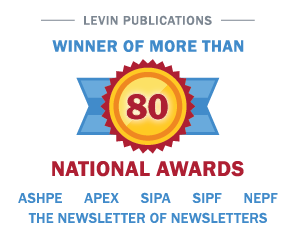 Founded in 1948, Irving Levin Associates has won over twenty awards in the past five years from the Specialized Information Publishers Foundation, The American Society of Healthcare Publication Editors and other prestigious organizations. Based in Norwalk, CT, this business-to-business firm publishes: The SeniorCare Investor, Senior Living Business, and The Health Care M&A Information Service. It also publishes a number of annual and quarterly acquisition reports and a leading transactional online database of health care and senior housing capital investments, mergers, and acquisitions.